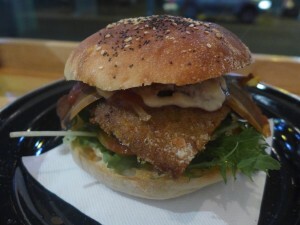 I love Melbourne, for all sorts of reasons, but one of them is that we are just so well served for vegan food here. Still, I do wish we had a Suzy Spoon’s branch here in Melbourne for the times when I feel like eating sausages and burgers. 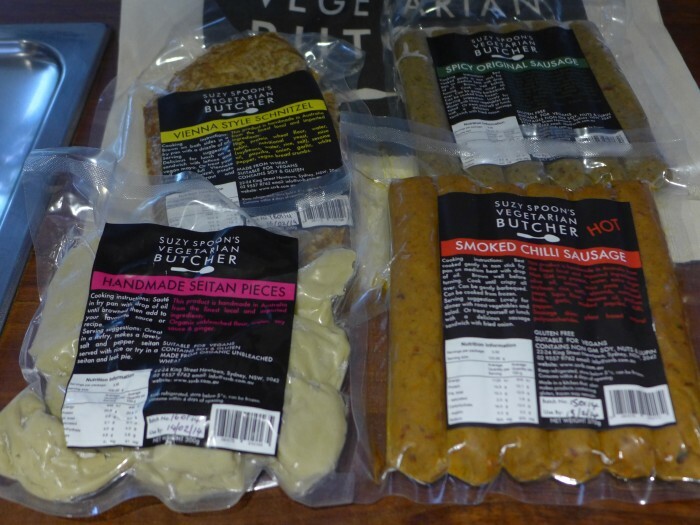 I think the sausage craving must be a legacy of having spent several months in Eastern Europe before I was vegan. Mostly I am not into replicating meat these days, but sometimes mock meat just hits the spot. For me it is a textural thing. I was in Sydney with a friend recently to see a couple of performances at the Sydney Festival, and to catch up with some friends. Happily, we were staying in Newtown, walking distance from Suzy’s. We were there for a few days so I had time to taste and sample. I had come prepared with space in my bag to bring home some goodies as well! Suzy Spoon’s was our first stop on Friday night for a latish dinner after dropping our bags. 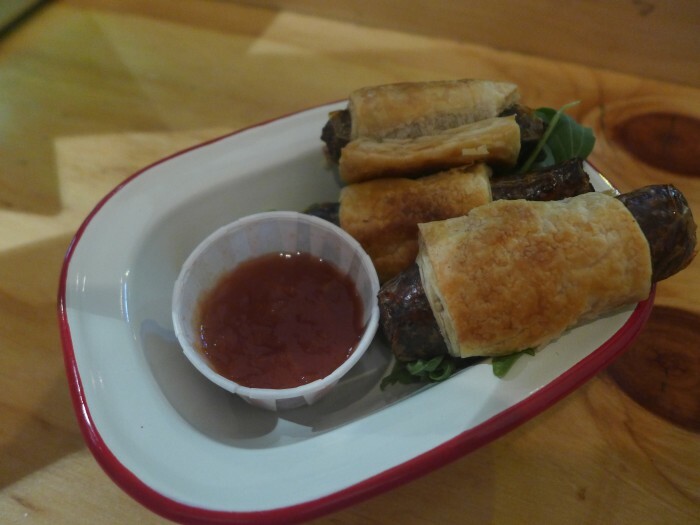 We started with some sausage rolls, handsomely served in a retro metal pie dish with some delicious home-made relish. These were literally a sausage rolled in puff pastry. Not what I was expecting. I much prefer Cindy’s justifiably famous sausage rolls which are just the best damn thing ever. After that slightly odd start, I had a schnitzel burger and my friend had a rosemary flavoured burger pattie. The burgers were really excellent. Good bread, fresh salad and all the burger trimmings, smoked ‘facon’, beetroot, mayo, tomato sauce and pineapple! 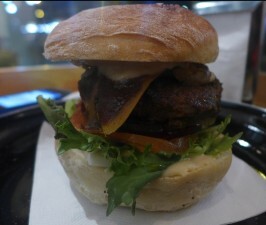 Probably the ‘meat’ was the least thrilling thing in the burger taste wise, but it did add a really good texture that was just right. It is also just so nice to go into a place where everything is vegan. On Monday before I went home I went back to stock up on some sausages, scnhitzel and handmade seitan to bring back and I also grabbed a delicious spicy ‘sausage’ sandwich for lunch at the airport before the flight home.